With the box once more restored to its proper condition, a start was made on rigging up equipment to simulate activity as it would have been when the box was operational. Most of the levers have been weighted to simulate real operation, although some are actually connected to real signals erected around the site. 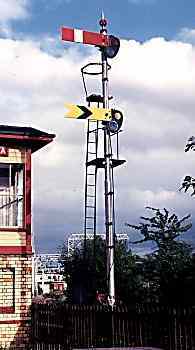 To the left of this view is Crewe Station "A" box and, in the far distance, Crewe North Junction box. Both of these boxes are also on display at the Crewe Heritage Centre. 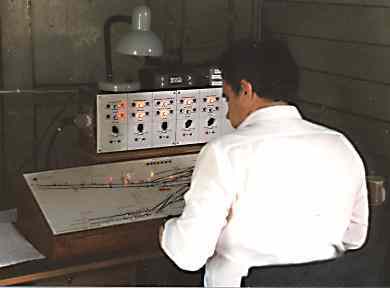 An electronic simulator has been provided, and the job working the simulator can be harder than working the box itself, for the operator has to act as signalman at all the adjacent boxes, make telephone calls representing local staff, and work the track circuit lights to emulate the passage of trains. 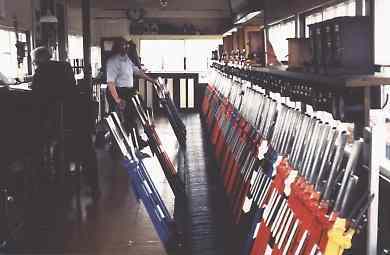 The box can be worked to the full summer timetable of the 1960's, although generally the box is demonstrated to visitors with a very limited timetable to allow movements and actions to be explained. A computer-based simulator is also available which allows the box to be operated from a program stored on a ‘laptop’ computer. Below you can watch a short video of a demonstration taking place in the box.